Please select the product you prefer. Cucusoft Apple TV Video Converter Suite is the complete Apple TV video Conversion software solution. This Suite includes 2 programs " Cucusoft Apple TV Video Converter" and " Cucusoft DVD to Apple TV Converter". In a nutshell, with this Apple TV Video Converter Suite, you can convert both your DVDs and video files to Apple TV format. Thus, you can enjoy your favorite DVD and video on your Apple TV. You can also get this DVD to Apple TV Converter Suite at a very practical price! Allows "Drag and Drop" in Apple TV Video Converter software. --In "Direct Mode", via DVD menu. --In "Batch Mode", via DVD Title list. 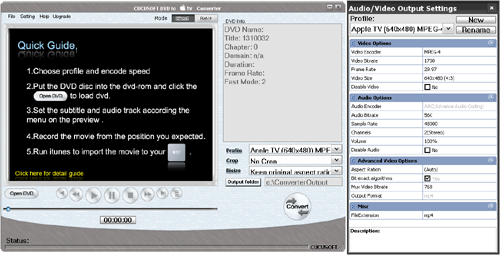 DVD to iPhone Converter" supports DVD to MP3 audio conversion. --With Cucusoft DVD to Apple TV + Apple TV Video Converter Suite, you get two powerful programs (Cucusoft Apple TV Video Converter and Cucusoft DVD to Apple TV Converter) at a discounted price. Reliable customer support that will always be happy to assist you. You may email your inquiries at support@cucusoft.com. Cucusoft DVD to Apple TV Converter is the simplest and fastest DVD to Apple TV converter software for Apple Apple TV available for purchase online. It can convert almost all kinds of DVD to Apple TV format faster than real-time, hence, making it the most powerful DVD to Apple TV converter in the market. The converter transforms your Apple TV to a portable DVD player so you can enjoy watching your favorite DVDs at any given place and time. Lastly, you can get this program at a very affordable price too! No monthly or annual subscription fees and no hidden charges for software updates making it indeed a smart purchase.